Happy Thursday everyone! Robin here with my inspiration of the week for Dies R Us, YOUR one stop shop for dies, dies and more dies! Although fall is almost here, at least on the calendar, it's more like the middle of summer in Southern California. This week we are in the 100's, the AC has been non-stop and brush fires are a constant worry. Hopefully by the end of the week it will drop into the low 90's; keeping my fingers crossed. 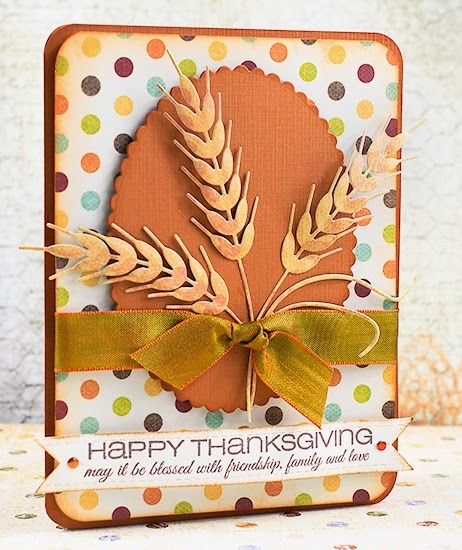 My card uses Impression Obsession Wheat die and Cheery Lynn Scalloped Window Stacker die. 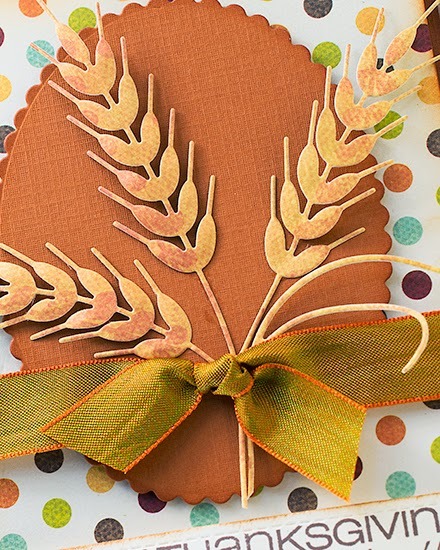 I chose a tone on tone paper for the wheat die cuts and a contrast paper for the scalloped oval. My card is layered with foam pop ups, the sentiment is stamped on a homemade banner and all edges have been sponged with Distress Ink. The card is finished with a simple bow and nail heads. The holidays are almost here, don't forget to check out all the new dies! Dies R Us has the latest releases from your favorite companies and at amazing prices! Plus, shipping is FREE when you spend $35 or more! And speaking of holidays, the Dies R Us Challenge for Team B is "Fall Festival". Stop by and be inspired by our design team; then make your project and submit. You could win a gift certificate to Dies R Us! This is just outstanding! Such a stunning card! That wheat just makes such a beautiful statement all by itself. I'm sorry now I didn't get that one too! lol And you need to share your secret for tying such a great bow too! WOW! Simple yet gorgeous! Well done Robin!